I’ve been taking pictures like this one all day today as I have bounced backward and forward between the shoreline of Lake Lucerne (or Vierwaldstättersee as we should call it if only we could pronounce it) and the town itself. Lucerne has a few interesting bits and pieces including a wooden bridge called the Kapellbrücke which spans across the river that divides Lucerne into two. Most of the structure burnt down in a fire in August 1993 and I couldn’t help thinking that it must have been a blessing in disguise to the tourist officials as the history of the bridge burning down and what they did to replace it was far more engaging than the story of its previous 700 years of existence. This brooding picture of the many brooding pictures I have taken today is however relevant to my plans for the next few days. You can see the town of Lucerne on the right (including the large black structure which I mentioned earlier and which I have now discovered is the town’s art museum, plus café, shop and all the other bits that people spend more time in than actually examining the art…). On the left is Mount Pilatus which, at 2,132 metres is just a fraction higher than the St. Gotthard pass. Obviously a mountain is a mountain and a pass a pass (the bit between two mountains) but I stood and stared at it for a while trying to contemplate the size of the task in hand. I then had to sit down and do the same thing. With the weather as it has been today you couldn’t even see the highest point of the thing. 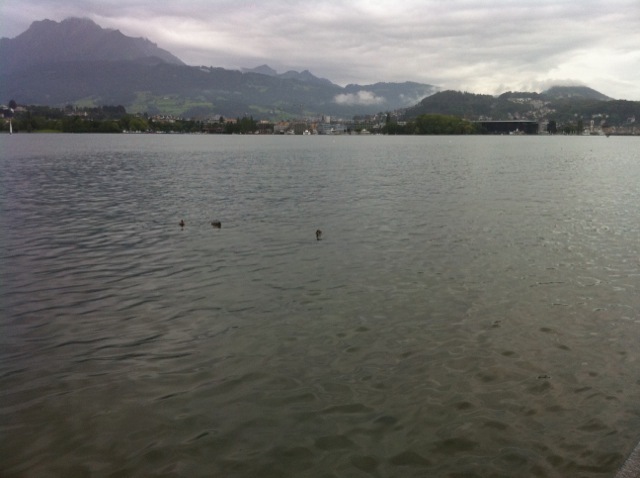 On returning to the campsite I was delighted to discover in the Rough Guide that when Queen Victoria came to stay in Lucerne in 1868 she went up on a mule to the top. If she can do such a height on a mule surely I can do it on a bike, no? Tuesday 3rd (tomorrow): cycle to either the campsite at Flûelen or Altdorf. The trip is mainly flat as it is around the lake and at one point involves taking a ferry to get to the other side. I had a conversation to a chap at the site in Altdorf earlier but he didn’t speak English or French and I didn’t speak German; I’m not sure whether I booked myself in or not. He didn’t seem interested in noting down my name so I suspect I didn’t. None of the sites so far en route have turned me away but if you are heading into a high valley, alternative options are limited. Then I found out about the other site so I should be OK.
Wednesday 4th: Altdorf to Andermatt. It will have to be a hotel here as there is no campsite. It will also mean cutting the main ascent up to the pass into two. Thursday 5th: Andermatt to the St. Gotthard pass. Not far horizontally but around 700 metres vertically. I would love to spend the night at the top but it would be dependant upon two things; the weather and also simply if I am able to do so. Camping up there would be fun but there is no site…. If I have to wait a day for better weather for this last bit I’m prepared to wait. It would be a disappointment to get to the top and not have a view to look at. Tomorrow’s cycle may be the last flat one for some considerable time.